This project examines quantum functional devices in the conjugated polymer system for molecular electronic devices and circuits. These enhanced circuits are aimed to be more energy thrifty than conventional transistor-only circuits and facilitate high-speed operation to reach node-to-node wireless communication. Conjugated polymers, with pi molecular orbitals delocalized along the polymer chain, are useful organic semiconductors that provide the possibility of molecular electronics for low power organic-based memory and logic. Quantum functional devices based upon carrier tunneling processes open vistas into very efficient and low power consumption circuitry that would be ideal for these applications. We demonstrate here strong room temperature NDR for poly[2-methoxy-5-(2'-ethyl-hexyloxy)-1,4-phenylenevinylene] (MEH-PPV) polymer tunnel diodes using a thin TiO2 tunneling layer (~2-8 nm) sandwiched between the MEH-PPV and the indium tin oxide anode. A key advantage is the pronounced NDR using a thick polymer layer with a large active area, circumnavigating the need for molecularly sized junctions. Current-voltage measurements show large and reproducible NDR with a PVCR as high as 53 at room temperature. We also demonstrate basic logic circuit operation using a pair of these polymer tunnel diodes connected in series to form a monostable-bistable transition logic element latch. Our results indicate that polymer tunnel diodes are potential candidates for many flexible, low-power logic and memory applications for organic devices by using low-cost and simple solution processing. 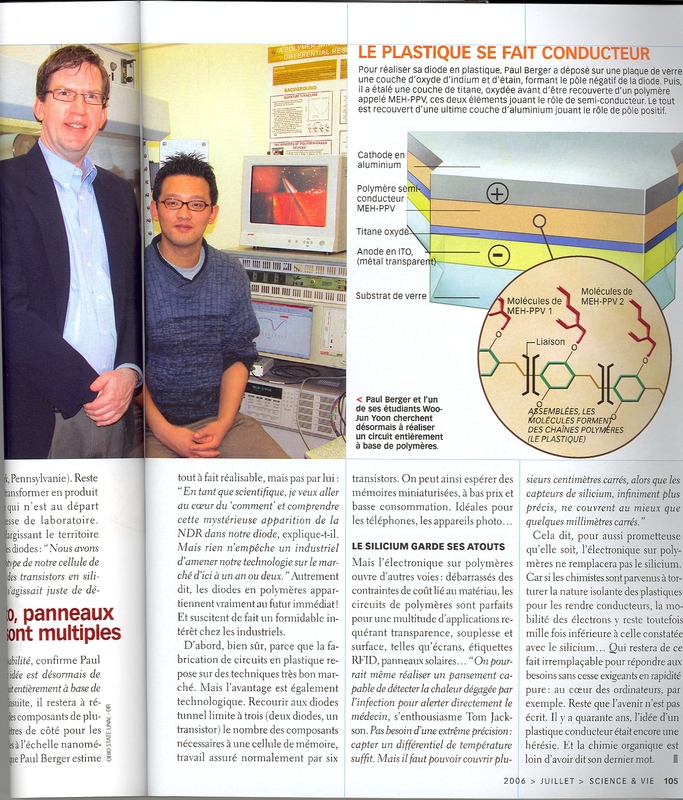 Science and Vie (France's Scientific American): "Plastic diodes promise low cost memory" (July 2006). 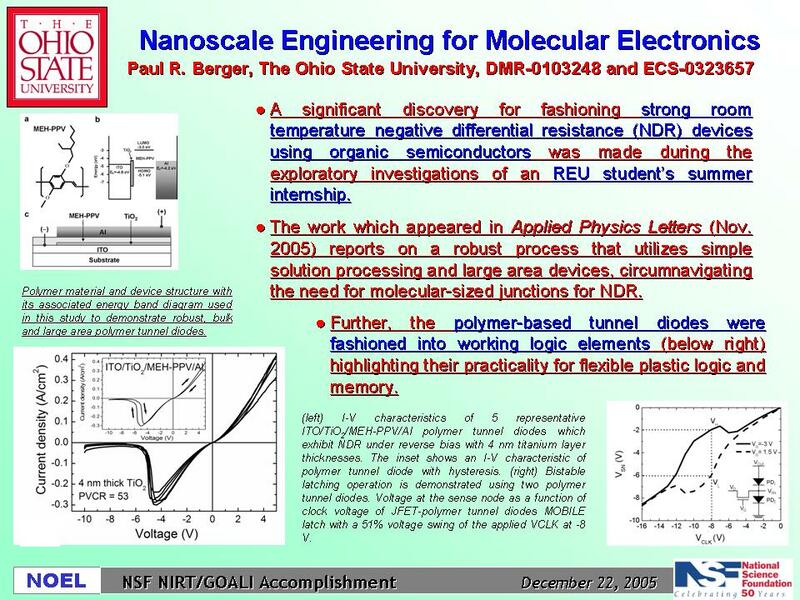 "Demonstration of Room Temperature Negative Differential Resistance in Polymer Diodes Using a Thin Oxide Tunneling Barrier at the Anode," Paul R. Berger and Woo-Jun Yoon, [Disclosure submitted May 17, 2005; provisional filed November 3, 2005, full patent filed November 3, 2006, Serial. No. & Code 11/592,419]. "Viability Bounds of M2M Communication using Energy-Harvesting and Passive Wake-up Radio," Jukka Rinne, Jari Keskinen, Paul R. Berger, Donald Lupo, and Mikko Valkama, IEEE Access, Energy Harvesting and Scavenging: Technologies, Algorithms, and Communication Protocols, https://doi.org/10.1109/ACCESS.2017.2713878 (June 8, 2017). "Feasibility and Fundamental Limits of Energy-Harvesting bases M2M Communications," Jukka Rinne, Jari Keskinen, Paul Berger, Donald Lupo, Mikko Valkama, International Journal of Wireless Information Networks, https://doi.org/10.1007/s10776-017-0358-z, 2017, pp. 1-9. Paul R. Berger, "Fully Printable and Autonomously Powered Electronic Nodes for the Internet of Everything," 6th Fall Colloquium on Flexible and Wearable Electronics, ED/SSC Baltimore Chapter [Co-sponsored by the Washington / Northern Virginia Chapter of Engineering in Medicine and Biology] (October 12, 2017). Paul R. Berger, "Printed Organic Electronics," Universitat Rovira Virgili, Tarragona, Spain, ED Spain Chapter (May 23, 2016). Paul R. Berger, "Plastic SmartCards Using Quantum Tunneling Electronics," ED/SSC New York Chapter, Colombia University, New York City, NY (October 6, 2014). Paul R. Berger, "Plastic Low-Cost SmartCards Using Quantum Tunneling Electronics," ED Indonesia Chapter, Politeknik Negeri Batam, Batam, Indonesia (August 19, 2013). Paul R. Berger, "Plastic Low-Cost SmartCards Using Quantum Tunneling Electronics," ED Indonesia Chapter, Bandung Institute of Technology, Bandung, Indonesia (August 16, 2013). Paul R. Berger, "Negative Differential Resistance Devices for Quantum Functional Circuitry," ED/AES/AP/MTT/GRS/NPS East Ukraine Chapter, The O.Ya. Usikov Institute of Radio Physics and Electronics of the National Academy of Sciences of Ukraine (IRE NASU) at Kharkiv, Ukraine (August 26, 2011). Paul R. Berger, "Negative Differential Resistance Devices for Quantum Functional Circuitry," ED/SSC Hong Kong Chapter, Hong Kong University of Science and Technology (March 2011). Fabrication and defect properties of ultra-thin TiO2 interfacial layers for hybrid tunnel diodes," J. Guttman, C. Chambers, P. Heinonen, D. Lupo, and P. R. Berger, 2015 Fall MRS Meeting (Boston, MA, November 29 to December 4, 2015). Nominated for Best Poster Award. "Fabrication and defect properties of ultra-thin TiO2 interfacial layers for hybrid tunnel diodes," P. Heinonen, C. Chambers, P. S. Heljo, P. R. Berger, and D. Lupo, 2014 Fall MRS Meeting (Boston, MA, November 30 to December 5, 2014). "Resonant Tunneling and Room Temperature Negative Differential Resistance in TiO2/MEH-PPV Junctions for Quantum Functional Circuits," Woo-Jun Yoon, Andrew P. Bonifas, Richard L. McCreery, and Paul R. Berger, OSA's Organic Photonics and Electronics (OPE) Topical Meeting at Rochester, NY, (October 9-11, 2006). technology; download free Acrobat products here. Last updated October 24, 2017. Send suggestions or comments to pberger@ieee.org.